We’re 11 days into 2012 already. So how many of you keep writing and saying 2011? Different year, same old problem. Well, we’ve come up with a clever solution to the problem in the Freelancealot office, and we’ve decided to share it with you for FREE! Meet the ‘It’s 2012!’ memory aid desktop picture. Of course, we realise this image isn’t appropriate for every office, but for those individuals and freelancers who work from home and who suffer from what-year-is-it-itis this could be a timely cure. Something we see while we work? We spend most of the day glued to our computers, so that was the obvious delivery method for our memory aid—and by being close to the phone, it killed two birds with one stone. A desktop picture (or ‘wallpaper’) was the ideal solution for our business to keep on track in 2012. A strong visual memory that brings us good cheer? 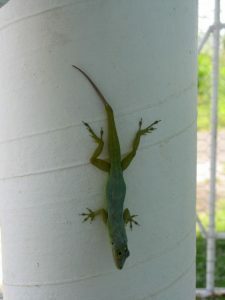 We love to travel, and during our time in the Caribbean we’ve come across quite a few Anole. These little green fellas are handy to have around as they’re great at keeping the ants and bugs at bay (so maybe he’ll keep your desktop bug-free ;)). The first one we met always visited us in the late afternoon for his ant dinner. We called him ‘Aintree’, the reason escapes me now however. Since then we’ve met Aintree II, Aintree III, Aintree IV …. It seemed only natural to us that we include an Aintree in our ‘It’s 2012!’ memory aid. 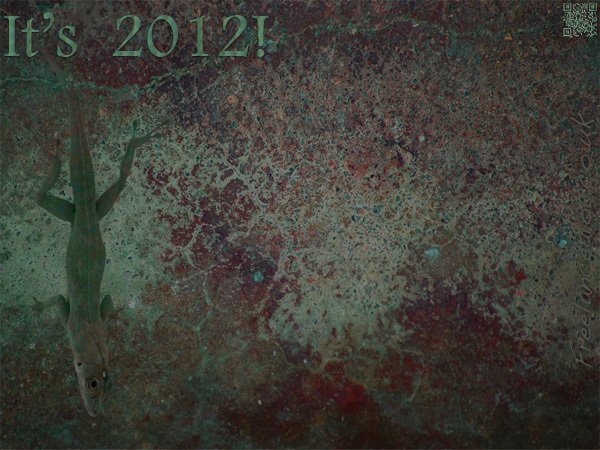 We designed the image in Adobe Photoshop—I’m particularly partial to the Anole-skin pattern applied to the It’s 2012! text. Having both a MacBook Pro 17″ and Sony Vaio laptops in the Freelancealot office, we designed the image at 1600 x 900 for the Vaio and at 1680 x 1050 for the MacBook . Once we’d decided to offer the destop to our readers, we added a trendy QR Code (also done in Aintree II pattern) that has a link to the Freelancealot.co.uk website, and made a few more at various sizes, including one for the iPad . In an effort to lure our readers over to Freelancealot’s NEW Google+ page, we’ve posted the link to the FREE ‘It’s 2012!’ desktop picture files there. You’ll get a .zip file that includes all the sizes so you can choose the best one for your screen resolution. If you have a Google+ account, we’d be thrilled if you added us to one of your circles while you’re there. Don’t worry, there aren’t any catches; the files are definitely FREE. However, we are only giving you permission to use the image as a desktop picture on your own computer/s. You do not have permission to use them in any other design works, you cannot repackage the images, and you cannot sell them. Of course, we encourage you to send your friends, family, and work colleagues over to our Google+ page to download the images. Or you can share a link to this post using the ‘Email this Post’ link below. Wishing good health, good cheer, and success to you all in 2012!